This is George. He's cute, but this photo was an absolute miracle. It was hard to keep a pup calm with a full box of treats and toys next to him. His face looks darling in this photo, like butter wouldn't melt, but he definitely left a whirlwind of destruction behind him in his excitement of the contents of this box. But with that face, you have to forgive him. His excitement was all down to Pawsome Box. A dog subscription box that sends treats, toys and accessories straight to your door. All boxes are tailored to your doggy. 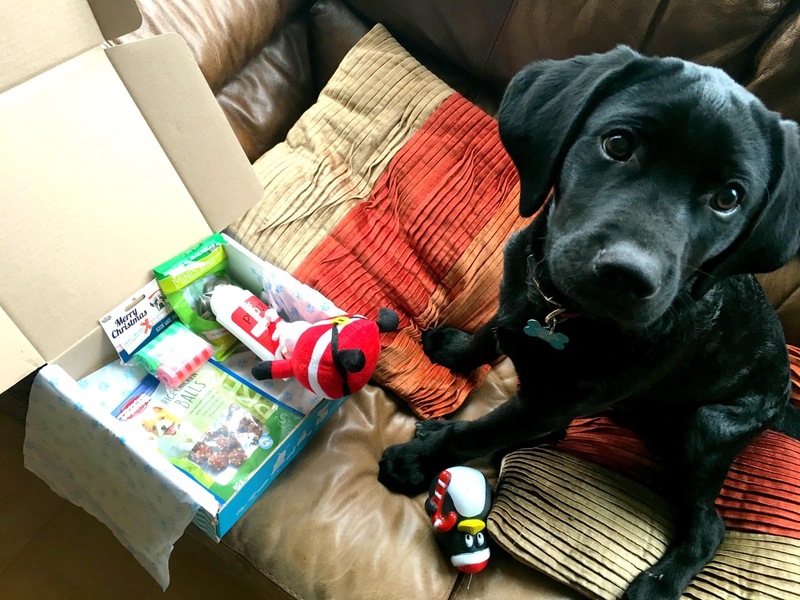 When signing up to receive the boxes, you complete your dog's profile, whether you've got an adult dog, a puppy, a large dog or small dog, the people behind Pawsome Box will ensure your dog has the right goodies for his age, breed and size. Here's what George received in his December box. 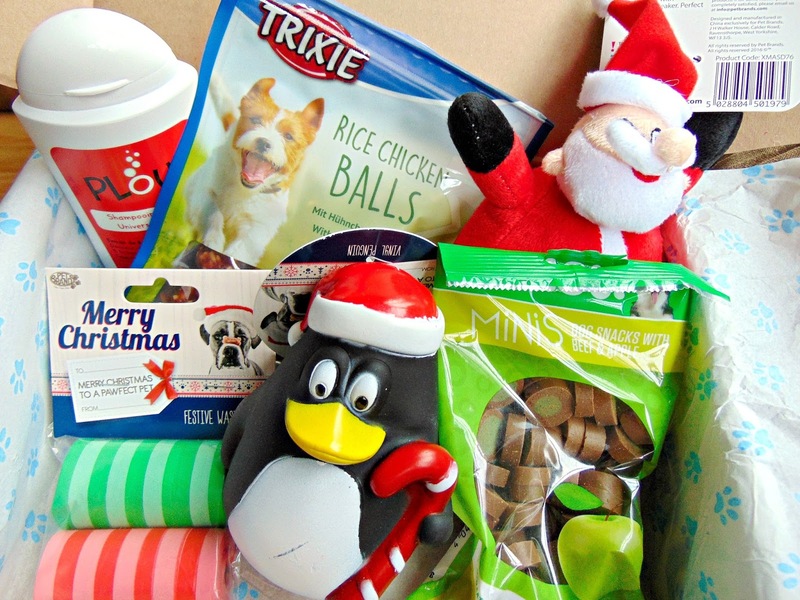 Each box includes 6 products and these can be treats, toys, accessories or hygiene products. As this was a December box, it was Christmas themed and it was such a joy to open! First off, we have the toys! 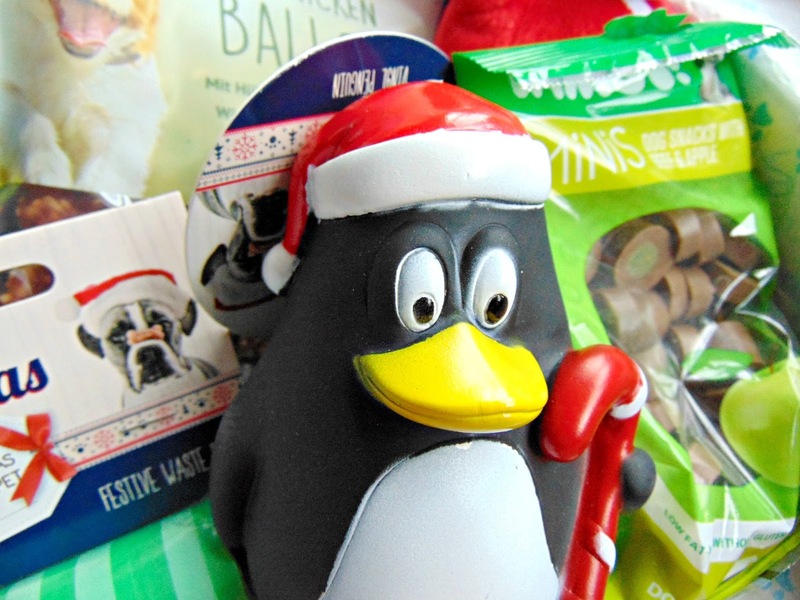 These Christmas themed toys, the Santa and penguin are too adorable and it was very sweet to see George run around with these in his mouth around Christmas time. George can destroy his toys in hours, but I'm pleased to say that these two are still around. They're durable, strong and they'll keep George entertained for hours. As soon as I opened the box he sniffed both of these out and ran off with them. They went down well! The practical items that I received in this box were Plouf shampoo and festive doggy bags. As a black Labrador, it can be difficult to see how mucky his coat is, therefore he needs a good shampoo to ensure his coat gets a good wash. This shampoo has been working wonders so far and I was very glad to find it in the subscription box. Along with the shampoo, there were some festive waste bags, which will come in very handy because let's be honest, you can never have enough of these. Finally, we have the treats. 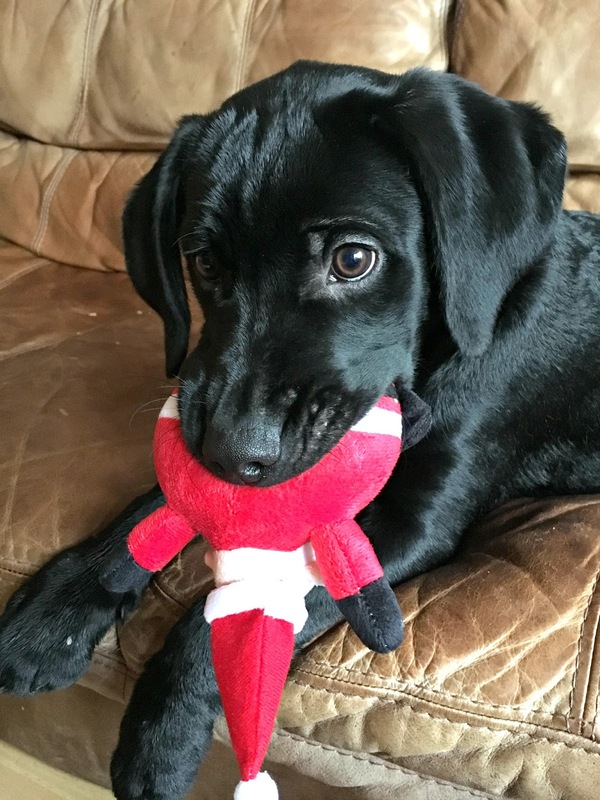 As George is still a puppy, we're trying to train him as much as he can so these dog treats will be very handy! We've been letting him off his lead when walking him in the woods so we've been going through lots of treats lately when training him to come back. He's been great so far, so more tasty treats are welcomed. In this box, George received Rice Chicken Balls and Beef and Apple treats. It's great value for money and it's a perfect little treat to pamper your pet with! You have the choice to pay monthly, 6-monthly or yearly for this subscription service, with the monthly Pawesome Box costing £19.50. Have you signed up this service? Also, if you're thinking of signing up, please feel free to use my discount code ukb04fop which will get you £5 off your first box. however all opinions are mine and George's.